Surgery to fuse the cervical spine. 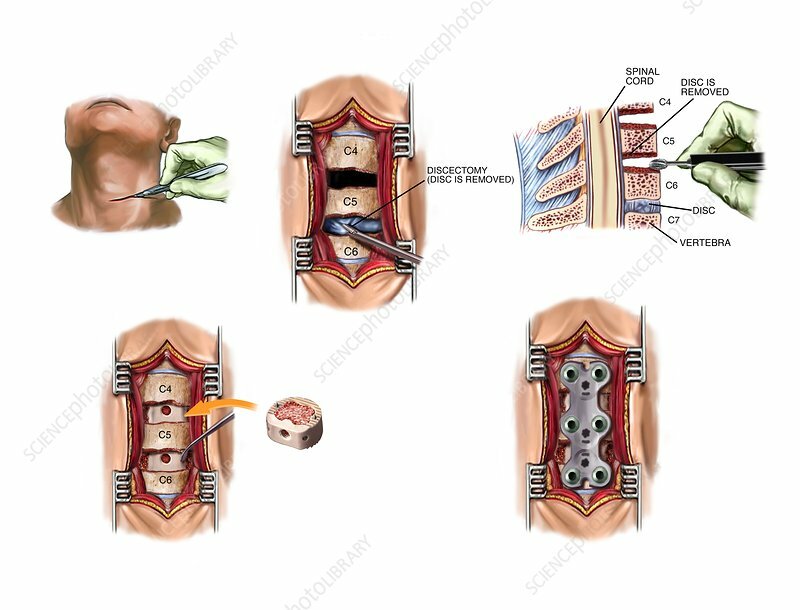 Sequence of artworks showing surgery to fuse and stabilise part of the cervical (neck) spine. This is an anterior cervical discectomy and fusion of the C4-C5 and C5-C6 joints, with plating. The incision in the throat (upper left) is followed by retractors used to draw back the overlying tissues. The fibrocartilage discs of the two joints are removed (discectomy, upper centre). At upper right (sagittal view), the space between the vertebrae is opened up with a high-speed drill. An interbody device with allograft material is used to add bone in the joint spaces (lower left) and a metal plate (lower right) screwed in to stabilise the spine.